In this week's Mailbag from Jon Wertheim: Discussions about Novak Djokovic's rise to No. 1, French Open scheduling, Serena Williams and Maria Sharapova's history and more. Have a question or comment for Jon? Email him at jon_wertheim@yahoo.com or tweet him @jon_wertheim. Roger Federer and Rafael Nadal can blame themselves for making Novak Djokovic the player he is today. For years, I watched in awe of Federer's ability to move on the court, hit ridiculous shots, turn defense into offense in a second and hit shots with pinpoint accuracy. Then Nadal brought his brawl-like game, death by a thousand styles of play, mental ferocity and physical tenacity. And all the while, the youngest of the three siblings was being pushed around, dealing with his own issues; leaving his two older brothers get all the attention. He watched, learned and adapted. He has taken the best of Federer and Nadal, and not just improved it, but turned it into the weapon he needs to beat his opponents. 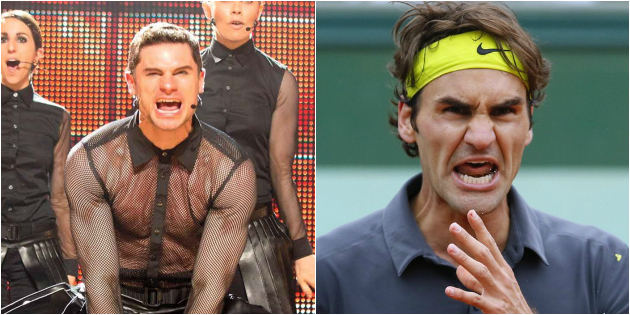 Maybe this why as much as I try, I cannot come to cheer, and get behind him when he plays either Federer or Nadal. Maybe watching the rowdy third child make a mess of things bothers us! • Well put. As Djokovic emerges as the French Open favorite—and, candidly, the favorite to rule tennis for the foreseeable future—we should take stock of how he got here. His emergence isn’t unique to tennis. It’s not even unique to sports. It’s the nature of competition, is it not? A force has risen to the top, whether it’s the Holy Roman Empire, Ford Motors, Facebook or Roger Federer. Imbued with a specific/targeted quest, the competition adapts and innovates and improves and eventually a few capture market share and even upend the giant. As Ali nicely lays out, in the case of Djokovic, he combined Federer’s precision and professionalism with Nadal’s persistence. He realized that fitness was essential, a prerequisite for toppling the two. He realized, too, that he would need to win on all surfaces. He realized that he’d need to return peerlessly. He improved. He caught a few breaks along the way. Now his stock is trading at an all-time high. I know this topic seems tired...But if we are mainly fixating on major titles for the GOAT debate, isn't the 2015 French Open the most historically important tournament? Fork in the road? If Rafa loses I don't see him winning four more majors to pass Federer. Thoughts? • I wouldn’t say Nadal’s failure to win this tournament precludes him from ever wining again. But your larger point is well-taken. This is a major (no pun intended) plot point in the GOAT narrative. Not just for Nadal—who will face questions about his future, provided he fails to defend—but for Djokovic as well. He wins this puppy, completes the Slam box set, nudges toward double digit majors and suddenly….well, we have ourselves another candidate to follow. ​The fact that the French Open is the only Slam that starts on the first Sunday makes JP wonder: How much influence do the top players have over the scheduling of their matches, in terms of time of what day they start the tournament/what time of day they play ensuing matches? None? A bit? A lot? As for individual players, it gets dicey. I’ve linked this piece before but I feel like the U.S. Open tournament director let the world in on a dirty secret here. Money quote: “Some players would rather play when it’s cool. Some don’t want to finish after midnight or later.” He cited Mardy Fish, the men’s eighth seed, as an example of the latter. Wait, the preferences of Mardy Fish are relevant? You can only imagine the weight that Federer or Serena carry. And if my preferences are being met—“I would rather play when it’s cool and not in the Saharan afternoon”—doesn't that imbue me with a huge advantage? ​Looks like Rome has got it right: smaller hand towels for the players instead of those ginormous bath towels other tournaments use. They are so much more practical for wiping the sweat off your face and more wieldy for the ballkids to handle. Why don't more tournaments do this? I like this idea. But tournaments will tell you that keeping the players happy and feeling pampered is a big priority. If one player complains about Motel 6-sized towels, the bad publicity outstrips any financial benefit. What's with the WTA Madrid and Rome semifinals not being offered on espn3 when the ATP matches are? I know they are separate tours, separate deals with TV coverage and providers—but who dropped the ball? • Again, this is less about sexism, but rather about the WTA having an inferior TV deal. Here’s the real question: can anyone transcend the finger pointing and do anything here to solve this? There are two separate tours and two separate deals. But this is not unlike the frequent discussions about networks televising tape-delayed matches. The explanation quickly devolves into TV programming speak (“They were contractually obligated to pay it off….the productions costs needs to be leveraged”) but this means nothing to most fans. Here’s what they do know: in the age of Periscope—when we can watch live streaming of middle school band concerts—tennis still doesn't have its act together to give fans the content they demand. Is there any movement to have shot spot [Hawk-eye] used for clay courts? It seems like the players have more respect for the technology compared with umpires checking marks. There is sometimes debate about which is the correct mark on the terre battue, or if the mark is actually touching the line or not. • I agree that the players place trust in technology. But the accuracy diminishes on clay. So much so that it doesn't make sense to use Hawk-Eye on the terre battue. Which leaves us with the quaint image of officials descending from their lifeguard chair to check marks. What's your take on this stat? ​• Opportunistic, that Sharapova. Give her credit for that. But it is a symptom of one of these quirks—wonderful in its way—of tennis. Sharapova is usually unwavering in her self-belief. Against one player (and one player only), all this confidence vanishes. Now that the dream tennis match between Joao Sousa and Joao Souza has happened, I'd like to see this mixed doubles match happen: Venus Williams & Michael Venus vs. Sania Mirza & Mirza Basic. Although it's not likely to come to fruition, which team wins? • Well played. But as long as Tuna Altuna —the chef’s special this evening—is still an active pro, everyone else is playing for second place in the name game. • Your French Open suicide pool. • Changeover Read No. 3: Pete Bodo’s Ashe vs. Connors is coming soon. Check back on SI.com next week for an excerpt. • Here’s the Ronda Rousey piece. • Tennis Channel has the French Open covered. • Defending champion and World No. 4 Petra Kvitova committed to play the 2015 Connecticut Open. • More summer series news: The BB&T Atlanta Open will kick off its weeklong events with the smooth ’70s flair of the legendary Commodores on July 25. • The Chinese filmmaker Peter Ho-Sun Chan is making a movie about Li Na, the country’s biggest tennis star. Chan’s production company, We Pictures, said in a statement from Cannes, France, that the film will be based on Li’s autobiography, “Li Na: My Life,” and will be released in 2016. • Nick McCarvel on an Aussie claycourt specialist.